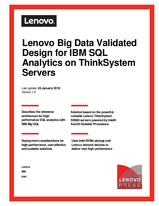 This document describes the reference architecture for the Lenovo Big Data Validated Design for IBM SQL Analytics with ThinkSystem Servers. It provides a predefined and optimized hardware infrastructure for high performance SQL analytics using IBM Big SQL software running on Hortonworks Data Platform (HDP), a distribution of Apache Hadoop and Apache Spark software from Hortonworks. This reference architecture provides planning, design considerations, and best practices for implementing IBM Big SQL on HDP with Lenovo and Intel products. The intended audience of this document is IT professionals, technical architects, sales engineers, and consultants to assist in planning, designing, and implementing the big data solution with Lenovo hardware. Achieving extremely high performance requires that high performance processors, large memory capacity and low-latency, high-bandwidth storage and networking are employed. The Lenovo servers used in this solution are powered by Intel Xeon Scalable Processor family processors and Intel NVMe solid state drives (SSDs). Furthermore, as enterprises exploit the value of SQL on Hadoop and deploy hardware platforms with high performance CPU’s and NVMe storage, the system connectivity requirements must also be addressed. Click the Download PDF button to view the document.